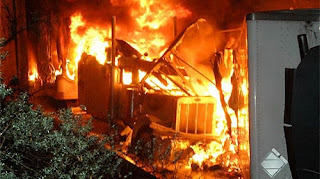 According to the LA Times, at least 5 trucks were involved in this fiery crash along I-5 near the Antelope Freeway Interchange. At least 10 injuries and one person is still missing as of this post. CHP is advising, requiring, all trucks to take CA126 to Ventura and down US101 to get to LA. An alternate route is CA58 at Bakersfield south. You can take CA58 to US395 and head south at Four Corners. This route will take you to I-15 south to inland Southern California, ie: San Bernardino, Riverside and San Diego. CHP is expecting I-5 to be shut down throughout the weekend because of structural damage to the truck tunnel. Be Safe, Be Alert and pray for those fellow truck drivers who may be hurt or still missing from this tragic accident in Los Angeles today. You can read more about this accident at the Los Angeles Times. Update: As of 11:18 AM, CHP officials confirmed 2 fatalities in this tragic accident. Unknown if they were truck drivers or four wheelers.